Lush, kissably soft lips. 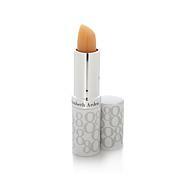 This creamy lip balm with sun protection is designed to give your lips a look that says pampered and privileged. In 2 words — Kiss me. Polybutene, Microcrystalline Wax/Cera Microcristallina/Cire Microcristalline, Petrolatum, Ricinus Communis (Castor) Seed Oil, Butyrospermum Parkii (Shea) Butter, Nylon-12, Dioctyldodecyl Dodecanedioate, C12-15 Alkyl Benzoate, Glycereth-26, Butyloctyl Salicylate, Lanolin, Astrocaryum Murumuru Seed Butter, Beeswax/Cera Alba/Cire D'abeille, Copernicia Cerifera (Carnauba) Wax/Cera Carnauba/Cire De Carnauba, Helianthus Annuus (Sunflower) Seed Oil, Honey Extract, Hydrogenated Castor Oil, Linoleic Acid, Linolenic Acid, Nasturtium Officinale Flower/Leaf Extract, Retinyl Palmitate, Tocopherol, Tocopheryl Acetate, BHT, Iron Oxides (CI 77491, CI 77492). For this price, I expect a lot more. It's a petroleum jelly consistency and doesn't do much in the way of moisturizing. The staying power isn't great either. I find myself reapplying every hour. As someone with very dry skin and lips, it's definitely not gonna do the trick. Nothing works for me and unfortunately this is on that list.